Mon., March 28, 2016, 11:01 p.m.
DALLAS – Jamie Weisner carried the trophy, and Ruth Hamblin had a net draped over her shoulders. 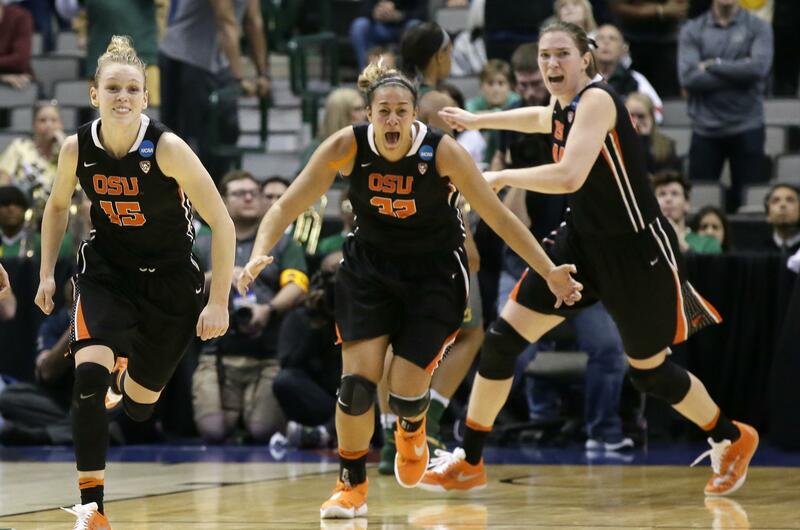 While the road to Oregon State’s first women’s Final Four has been quite a ride for those two seniors, it is even more remarkable considering the shambles the program was in when coach Scott Rueck arrived six years ago. Sydney Wiese scored 18 points, including three free throws in the final 33 seconds to push the Beavers past Baylor 60-57 on Monday night in the Dallas Regional final – about 2,000 miles from their home, and only about 100 miles from the Waco campus of the top-seeded Lady Bears. Weisner, the Pac-12 Player of the Year who was the regional Most Outstanding Player and was named second-team AP All-America on Monday, had 16 points while Hamblin had 10 points and 12 rebounds for the Beavers in their first regional final. Gabriella Hanson also added 10 points. Oregon State has won 22 of its past 23 games and has already set a school record for victories this season. They won the Pac-12 tournament and shared the regular-season title, after last season winning the crown outright to end Stanford’s run of 14 championships in a row. After Weise made both free throws, Baylor quickly got back down the court. Jones couldn’t get off a shot before a missed 3-pointer by Niya Johnson, the senior point guard in her last chance for a Final Four. Weisner, a Spokane native who graduated from Clarkston High School, scored twice in the final 2:07 of the third quarter to beat the shot-clock buzzer. Baylor led only twice, after scoring the game’s first four points and when Nina Davis made a layup with 6:54 left to make it 51-50. Davis had 11 points. The game’s only four ties came after that, the first when Weisner made a free throw 24 seconds later. Big finish: Jones’ reverse layup with 1:41 left in the first half got Baylor within 26-25. But Oregon State scored the last eight points of the half for its largest lead of the game, including Weisner hitting an open 3 off Wiese’s inbound pass at the buzzer. Cave’s own run: Baylor junior post Khadijiah Cave had a 6-0 run all by herself in a 48-second span. Cave had a put-back basket, and after a Beavers miss scored on a pass by Jones before stealing the inbound pass for another layup. Oregon State: The Beavers missed their first five shots at the start of both halves. … Oregon State had seven 3-pointers, all in the first half. Baylor: The Lady Bears’ most recent Final Four was in 2012, part of their 40-0 national championship. They lost in the regional finals to Notre Dame the previous two seasons. … Baylor made only 6 of 14 free throws. … Freshman Kalani Brown had 12 points, including two baskets when she had put-backs of her own misses (making the third time on one of them). Published: March 28, 2016, 11:01 p.m.